Keeps it tight, lets it groove and smacks it up. With 30 releases, 2 Mix CDs, a Breakspoll Award, and a back catalogue of remixes being played by everyone from Breakbeat dons the Plump DJs, Freakout funksters The Cuban Brothers, and Baltimore godfather Scottie B, Nick Thayer is no stranger to variety. Passenger Records latest hero has put together a consummate selection of Beats, Breaks and Bass lines in this exclusive sample collection for Loopmasters Artist Series, for producers worldwide looking for a direct injection of Breaks party samples tuned for the dancefloor and with a pedigree you can rely on. The Breaks Producer collection includes over 350 samples, with more than 40 Sub crunching and resonant Bass grooves, 75 Heavy Duty Breakbeat Drumloops, 45 Atmospheric and groove based Musical Loops, 20 processed vocal loops and samples, Searing SFX and more than 100 single Drum sounds suitable for programming your own heavyweight drum patterns and breaks. Also included in this pack are 15 multi-sampled instruments ready to load and play in your favorite soft sampler. 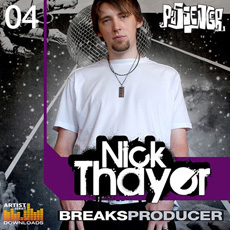 Available in multiple formats and with every sample guaranteed royalty free for you as with all Loopmasters titles, if you are making breaks, drum and bass, hip hop or other modern styles and you need some pre-tuned, Dance floor friendly sounds to kick off your next production, then check out this release from Nick Thayer, Passenger and Loopmasters today! Tech Specs: 380Mb download including 371 Wav Samples, 170 Rex2 Loops, 30 Patches for Soft Samplers.